The toolkit is a collection of assessment tools and checklists that describe the key considerations to be taken into account when transitioning to Option B/B+. The toolkit provides a roadmap to support the planning and implementation of Option B/B+, and to help countries scale up more effective interventions and programs to achieve the goals of the Global Plan Towards the Elimination of New HIV Infections among Children by 2015 and Keeping their Mothers Alive. Programme implementers and policymakers can use the toolkit in its entirety or select from the 10 sections that address different programme components. The toolkit is not intended to be exhaustive, but provides a critical step in presenting the various political, financial and programmatic factors to consider when implementing Option B/B+. Why was the toolkit developed? 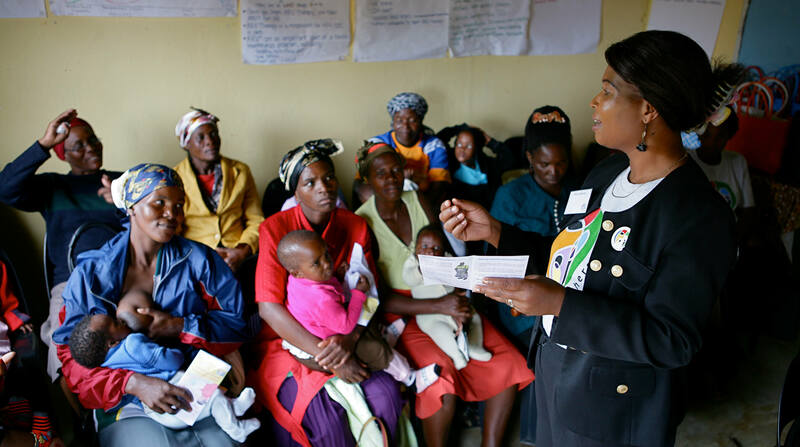 The potential for prevention of mother-to-child transmission (PMTCT) to have a profound impact on the HIV epidemic and broader maternal and child health agenda has never been clearer and more compelling. In response to these tremendous opportunities and to WHO’s recent programmatic update on PMTCT, this toolkit is primarily meant to help countries begin the process of thinking through key programmatic issues. Careful planning that addresses these key issues can hopefully help countries avoid unnecessary bottlenecks in rolling-out Option B/B+. The toolkit focuses on pre-implementation planning at the national level, recognizing that sub-national planning is a part of the process. The toolkit is comprehensive, however, it does not have to be used in its entirety. Each module stands on its own and can be used selectively depending on each user’s specific needs and interests. Target Audience: Designed to provide easily accessible, succinct, and user-friendly items (key questions, checklists, etc. ), the toolkit can be used by Ministries of Health (MOH), in particular, national PMTCT and other technical working groups, as well as IATT member organisations, and other partners as these groups work together to plan for and implement Option B/B+. Public interested in better understanding EMTCT and HIV programming. How was the toolkit developed? Given the increasing number of countries that approved the shift to Option B/B+ in 2011 and 2012, the need to provide standard guidance to inform the planning implementation phase was identified. The considerations presented in the toolkit draw on lessons learned from Malawi’s experience as the first country to implement Option B/B+. A two-day meeting was held with 8 members of the IATT and hosted by the CDC in Atlanta. The IATT working groups prepared and peer-reviewed documents on pre-defined themes including: supply chain management, human resources for health, community engagement, and monitoring and evaluation The toolkit also incorporated inputs from the Global Steering Group of the Global Plan. Based on country needs and gaps identified in the toolkit, new modules were developed and added to it. How can you make the most of this toolkit? While exploring the toolkit, it is important to remember that these tools are broad guidelines which should be adapted to the specific context where Option B/B+ is being implemented. The toolkit summarizes the main questions to address when implementing Option B/B+ and includes checklists and guidance related to key components of the health system, which can be viewed together, or separately based on the interests or needs of the user. Please fill out our survey to provide feedback based on your experience using the toolkit. This will allow us to make improvements and ensure that it continues to respond to emerging needs. Option B/B+: Key Considerations for Country Programmes is an overarching guidance document which lays out key issues for implementation. The documents are organized by programme category and aligned with the PEPFAR Country Readiness Assessment Tools (Section 1 of the toolkit). For more specific discussion of the relative technical and business merits of Options A, B and B+, readers should see the aforementioned WHO’s April 2012 Programmatic Update on Option B/B+ as well as UNICEF/Business Leadership Council’s “A Business Case for Options B and B+: to Eliminate Mother to Child Transmission of HIV by 2015. The Moving Towards ART for All Pregnant and Breastfeeding Women Readiness Assessment Checklist and Discussion Guide is a comprehensive checklist for national programmes to review as they plan for implementation of Option B/B+. The checklist covers a large number of key programme areas from political commitment to early infant diagnosis, posing critical questions to be addressed as well as indicating minimum readiness standards for implementing Option B/B+. The Moving Towards Expanded HIV Services for Children Readiness Assessment Checklist and Discussion Guide may be used to assess the readiness by health systems to improve care and treatment of children. The HIV Rapid Test Quality Assurance Checklist facilitates the process of thinking through key HIV RT quality assurance (QA)1 and programmatic issues needed to improve HIV rapid testing in MNCH settings. The Tuberculosis / HIV Checklist is intended to assist in the integration of TB/HIV services into PMTCT and MNCH programs. The Costing Tool Considerations in Costing a Transition to Option B/B+ describes the costing models that can be used to cost operational plans for Option B/B+ implementation including descriptions of programme inputs and outputs associated with each model. The Human Resources for Health tool outlines key considerations around HR capacity and task-shifting as an essential component for successful implementation of Option B/B+. The Procurement and Supply Chain Management provides a list of key questions for the MOH to consider as they strengthen and adjust procurement and supply chain management systems to accommodate transition to Option B/B+, and includes links to resources and tools to assist with forecasting. The Enhanced Monitoring and Evaluation Systems provides an overview of concepts and questions to guide national discussion of M&E issues specific to Option B/B+ implementation, as well as quality assurance methods and a list of potential topics for operational research. The Community Engagement Tool. There are two tools on community engagement. The first consists of recommendations for Ministries of Health on involving communities in Option B/B+ planning and implementation discussions, while the second document is designed for civil society organisations to use in dialogue with the MOH to advocate for the rights of people living with HIV.